The MER is too low to account for the enormous valuation drift. So too is the (positive) effect provided by the interest earned on the majority of the ETF’s assets. Right now interest is so low that we can assume these two cancel each other out. Therefore, the other two variables are the key. 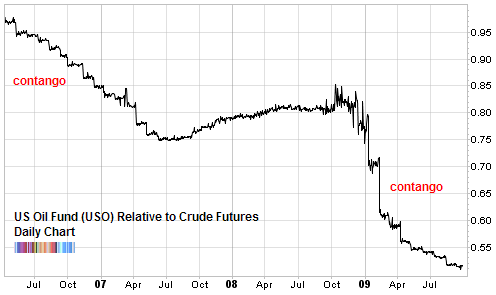 Contango occurs when later futures contract prices are more expensive than current contract prices. Backwardation is the opposite. We’ve been experiencing contango for about two years now. Right now the current NYMEX contract (November) is $70/barrel. Meanwhile the March 2010 is $72/barrel. This has meant that USO has had to buy slightly more expensive contracts every month, in effect, shaving a little off their asset valuation little by little. As well, due to the gigantic size of the fund, the impact of rollover exacerbates the already existing difference between expiring and forward month contracts. As USO sells their holdings, they push down prices and as they buy, their demand increases prices. Of course, other market participants can count on their rollover to front run their obligatory monthly cycle. 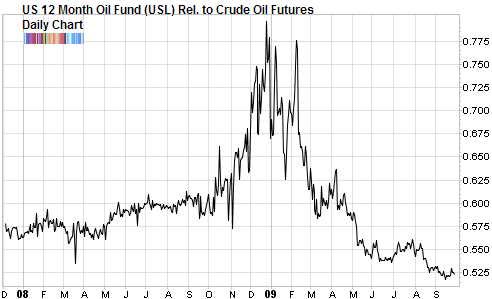 All this means that the fund has done an abysmal job in tracking the crude oil market. From the start of the year until now, crude oil futures have gone up about 50%. But if you tried to replicate that by buying USO instead, you would have been out of luck as the ETF has gained less than 5% for the year. Year to date, USL has returned about 16% while crude oil futures have increased in price by about 50%. A little better than USO’s horrendous under performance but still, not even close to tracking their underlying commodity. The conclusion is that you shouldn’t simply assume that an ETF will do what it is supposed to do. Almost all ETFs and for that matter any retail structured product is created to “feed the ducks” when they’re quacking. USO and USL are imperfect products when we use an intermediate to long term time horizon. They are appropriate for intra-day trading or swing trading but holding them as a proxy for the futures contract is self-defeating due to the valuation drift. If you want long term exposure to oil, buy the futures contract. Otherwise, buy small to medium size oil companies or explorers like Anadarko Petroleum (APC). Great points highlighted here about how these aren’t really the best of vehicles. We had a post up a while back comparing the various etf’s/etn’s and noting the pros and cons of each. The big drawback to USO is the suffering in contango obviously. But as you highlight, there’s no real pure play without using futures, which is a shame for retail investors looking to diversify to new asset classes. it would be interesting to compare this to DBO. I invested through DBO instead USO, and got hurt by the contengo, but it nonetheless performed way better than USO.